Sacred Revelations is Joost Dijkema's first record. Get a physical copy at the twindimensionrecords website. 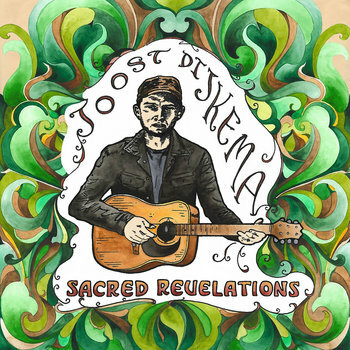 Dutch singer-songwriter Joost Dijkema debuts with a wonderful and diverse album of folk, americana and primitive guitar magic. The album starts with "The Sun Behind The Mountain," a fine solo guitar instrumental. On the title track "Sacred Revelations" Dijkema sings, and I am impressed how mature and authentic he sounds despite his youth and geographic distance from the motherland of country music blues. The third track is an uplifting slide guitar piece with strong Leo Kottke vibes: Wonderfully executed and catchy. I am quite fascinated by the fact that European folk music travelled to the new world with immigrants, was transformed and reimagined by a variety cultural influences, and has now been exported back as its own genre. Dijkema recorded an authentic sounding album, carefully crafted and beautifully executed. Even if this album plays with elements that you might find on every second album that gets released in that genre, Dijkema has what it takes to stand out. Find below a short interview that I made with him and which gives you more insight into the process of making the record. Hi Joost, how and where are you? Hi Marcus, I am actually waiting until Friday comes. I’m quite excited for what’s gonna happen after the release show. I realize already - here in The Netherlands - that a lot of people with different musical tastes kind of dig my music or they think "hey, this is something else!" I didn't expect that, because I listen to fingerpicking guitar heroes, but personally I don't know many other people who do. So, I guess there's people with an appetite for this kind of guitar soup. Where am I? At the moment I’m in my "small tower" apartment somewhere in Groningen in the Netherlands. There’s also a Groningen in the United States, but I think it’s only one or two streets. I wish to play there one day though! "Sacred Revelations" is your debut album. Can you tell me a bit about how this album came together? The songs are written in a period of one and a half year. I quit drinking for almost a year to get back on my feet again and face the fact that time had come to make my own record instead of staying in that circle with a bottle in my hand while thinking "one day when I'm sober...". The biggest part of the first year I practiced almost eight hours a day to learn the skills that I needed for the melodies that I wanted to play and heard in my mind. The lyrics are about being lovesick, changes and longing for revelations. The songs were recorded in a period of two days on a analog tape recorder at Hans Hannemann's Twang Wolf Recording Studio in Pekela. The overdubs took a little bit more time. For example, I thought about adding bass and drums during the session on the song Woodpecker, so I had to practice while I was in the studio. All the fiddle material by Heta Salkolahti is recorded in one day. Your album sounds very American. Is American music the main influence or where else do you draw inspiration from? Especially the songs with lyrics are more American flavored, I think. Since I heard Gene Clark, Townes van Zandt and Uncle Tupelo I've been playing country-ish music for a long long time, so I think it's not strange that you might hear American influences. But the last couple of years also English folk (rock) music crossed my path. I experience that music as mysterious and honest. Also, Michael Chapman's music has been a great influence since I first saw him at De Amer in, I think, 2006 when I worked there as a bartender. Other than the music, here in the province of Groningen there is a lot of open spaces, old churches and abandoned old factories. In the province of Drenthe, also in the north of the Netherlands and where I originally come from, there's a lot of forests and heath land. These kind of landscapes are inspiring to me. What's your fascination with American music? When I was 11 years old I bought my first Black Flag vinyl record called Damaged. The Ramones followed shortly after. It was before the time that everyone had internet. I kept a pop encyclopedia like a bible next to my pillow. I learned a lot of names and stories of bands, but hadn't heard the music, yet. Punk Rock music and skateboarding was my life in those days. Must've been between 1998 and 2005. When I was 14 my brother bought - for 1 euro on a flea market - the first Jason & The Scorchers record and that brought country-ish music into my life. Since then I dug deeper in the world of American folk and country music. Bluegrass music from Ralph Stanley or Old-timey from Uncle Dave Macon for example. It's so pure, because it's their culture, you know? Also The Byrds and Tony Joe White are high on my list of the all-time favorites. Shortly after, music from John Fahey, Robbie Basho, Jack Rose and Leo Kottke crossed my path and inspired me in the same way that punkrock did for me when I was a kid. The cover art of your album is a nice homage to Robert Crumb's Heroes of Blues, Jazz & Country. Who made the cover? Thanks, that's a great book. Plastic Crimewave aka Steve Krakow made the artwork for 'Sacred Revelations' in collaboration with Sara Gossett. Two great artists from the USA. Steve's got his own hand-drawn magazine - since 1995 - about folk, psych, garage, punk and rock music. It's called 'Galactic Zoo Dossier' and he also interviewed artists like Arthur Brown, John Renbourn and other remarkable sometimes forgotten musicians. Sara Gossett's style gives me a very optimistic feeling and her Art Nouveau/Deco kind of paintings are mostly made with water paint. I'm grateful that they both jumped on board to create the face of my record. What chances and challenges do you see in today’s musical landscape where it's easy to publish music but hard to get recognized? Making an album can cost a lot of money and the writing process takes time and energy. The challenge is not to be forgotten after a few weeks since its release, so searching for chances is recommended. There are a lot of kind promoters, colleague artists, record store owners and freelance writers willing to help pushing it forward when they believe in the music. When I was young and bought a cd or LP, I listened to it for a long time. If I liked it, it became a part of me. Nowadays it's so easy to press a button that says: next. There's so much. And mostly for free. It all comes with negatives and positives of course. The positive thing is that the artists without a support from an influential label/booker can promote themselves. But the internet is a big pile and getting recognized requires hard work and artistic input. My father doesn't have facebook, watches football and the news on TV, and reads the newspaper every day. How would I get to him if he wasn't my father but has - in some way - a similar musical taste? Well, trying to get an interview + gig on the local radio via the venue promoter and add gig information in the newspaper still might help to reach him. New small record labels can grow to become influential when they continue releasing quality music where they artistically believe in, but - I think - it's best to stick to a "genre" nowadays, so the label-listener knows kind of what they can expect. When another artist on the same label is rising, it could influence the other artists, because the label is a cradle and some babies grow faster. And perhaps there's less risk for a label when they sign let's say an Acid Jazz band when they mostly release Avant-garde. Music-lovers can start a blog and write about an artist, independently. These guys are treasure seekers and willing to write about new and upcoming artists and taking new music seriously for what it's worth. And of course there's the Social Media thing. I would like to perform my music in places all over the World (although that might be a bit optimistic), meet good people down the road and in the meantime continue writing compositions and songs for a second record. "Sacred Revelation" can be pre-ordered physically as 12" or as cd via the label Twin Dimension Records or digitally via Joost Dijkema's bandcamp page. Write a comment, say something!